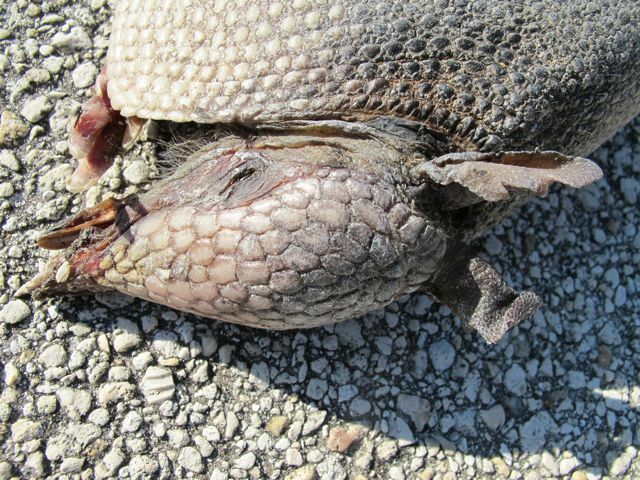 It was a huge treat to find a roadkilled armadillo the same evening, to be able to put my eyes and fingers on this creature and experience even more of it. That shell is HARD! You can knock on it and it sounds like hard polystyrene. It was more like a turtle shell than the leathery cape I'd imagined. Of course this specimen was pretty dessicated, but still, the shell was much harder than I thought it would be. What a marvelous integument this animal has; how specialized is its skin! What a wonderful world this is. 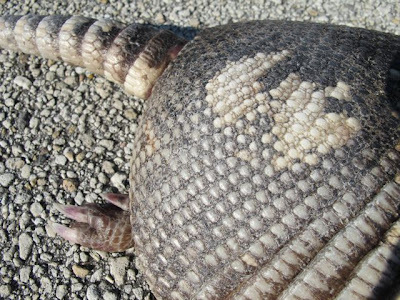 Armadillos haul lots of dry grass and plant material into their deep burrows, making a cozy nest where they give birth to their four identical quadruplets right about now (March/April). The young, born mobile and with open eyes, stay with their mom for most of a year, and then disperse. 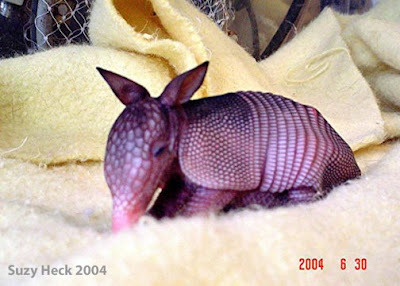 Armadillos can live about seven years in the wild and up to ten in captivity. 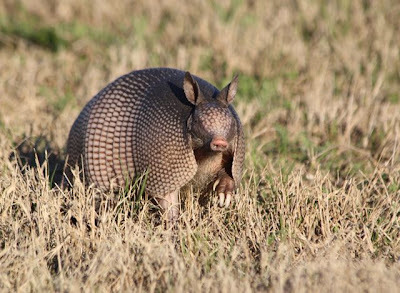 I cannot resist lifting some photos from an excellent overview of armadillos on Armadillo online. 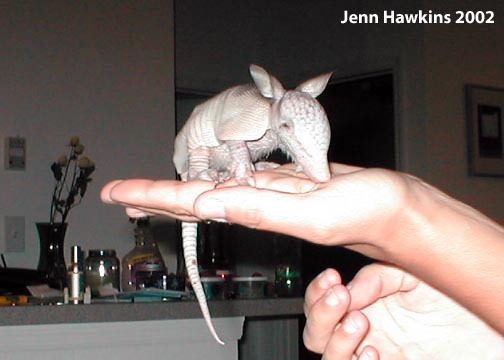 Because where else are you going to see babeh armadillos? With floppy wet leather, before their shells harden up? But oh, they harden up fast. 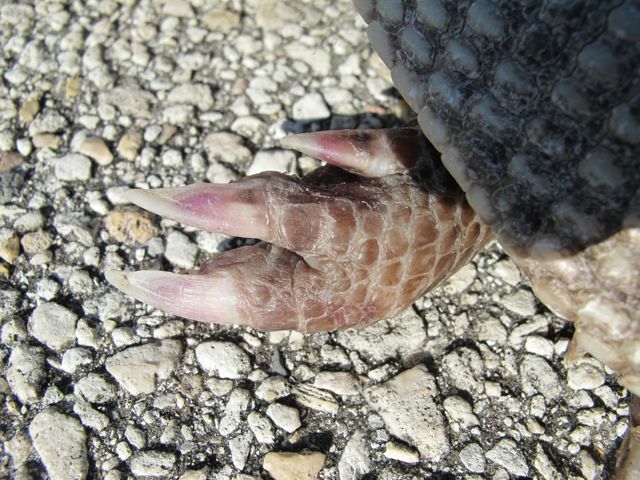 Imagine how fast these razor claws could slice through sand in a rapid descent into the earth, with all four feet churning at once. I've read that they can just disappear in seconds in a big fluff of sand. Even the top of its head is armored. Back to the living armadillo: Before long a little crowd gathered, attracted by my crouching form. 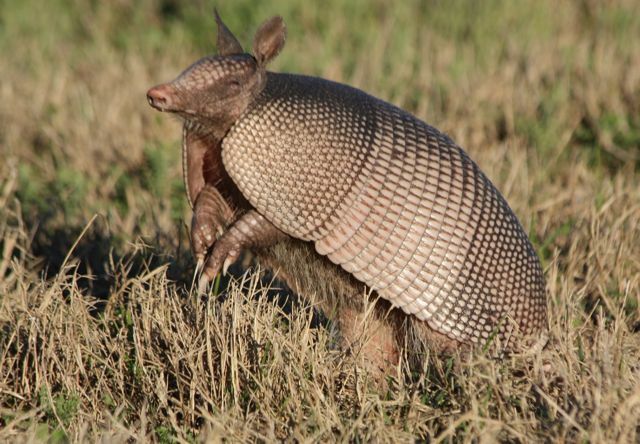 We all appreciated the armadillo together. 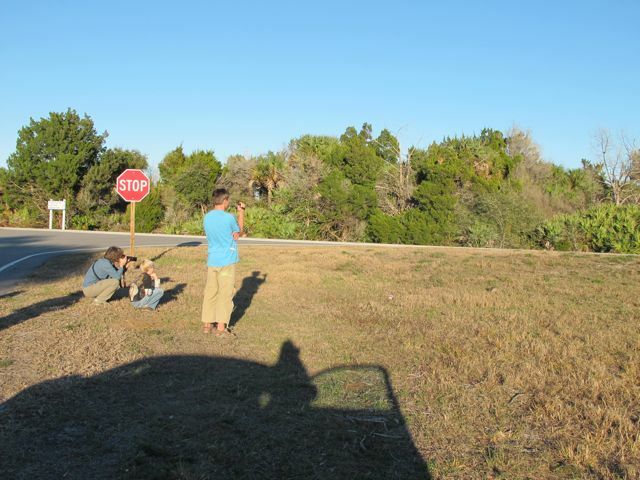 I like being in a place where people habitually stop to admire wildlife. 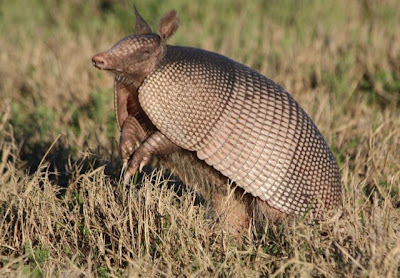 The kids and I were thoroughly amused by the long golden hair on the armadillo's soft underside. It's an unexpected detail, the mustache on the pretty lady, and it's very cute in real life. Liam kept saying, "He's so HAIRY!!" I don't know why we expected him to be other thanhairy. Maybe it was the yellowness of it, or the length...it was just a surprise. Thank you, little armored one, for interrupting your long nap and showing yourself to me and the kids. I owe you one. Hey! It's a wonderful kind of day! Oh wait. Arthur was an aardvark, wasn't he? I've held a baby one, a very long time ago, and can vouch for their cuteness quotient being sky high. The leprosy has not set in yet. how long have armadillos been in Ohio? Next time you are in FLorida, go to Tallahassee to the state hitory museum to see a livesized replica of a giant amadillo. I've eaten road-kill armadillo. Tasted like dry roast beef. Not bad at all. 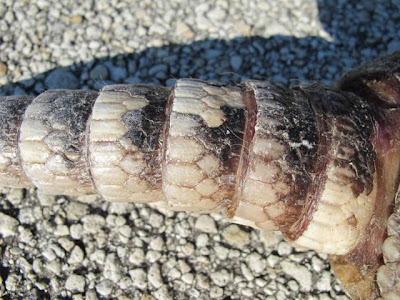 I think the tail is so armored so that it can curl up around the body for added protection to the underside. That baby one is so cute! 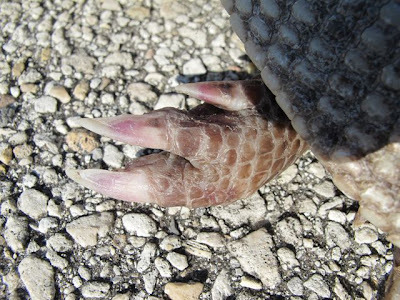 You may want to pack gloves in your car for roadkill inspections. I keep meaning to do that myself (he wrote sheepeishly). 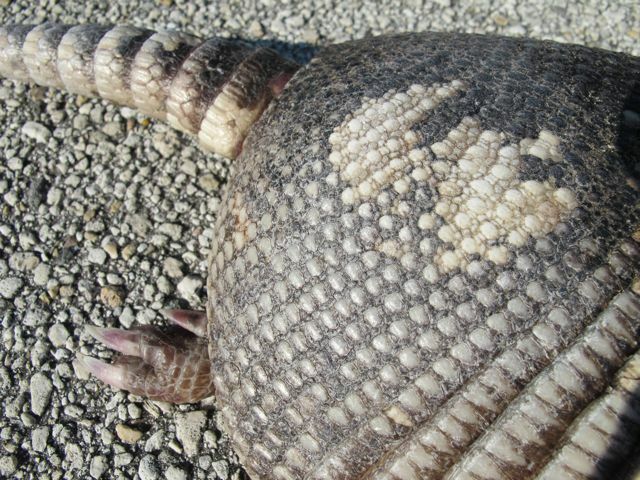 An armadillo's shell is made up of keratin, osteoderms and skin. Very, very solid! I'm not sure aboout function of the tail in the nine banded species, but the six banded tucks its tail in alongside its head to make a perfectly sealed football.